This evening I was cleaning up the photos on my iPhone and realized how many things we’ve done over the past couple seasons that I have failed to share here. Those of you who follow me on Facebook have seen some of this before, but in case you just follow my blog, let’s catch up with some of the things we did. 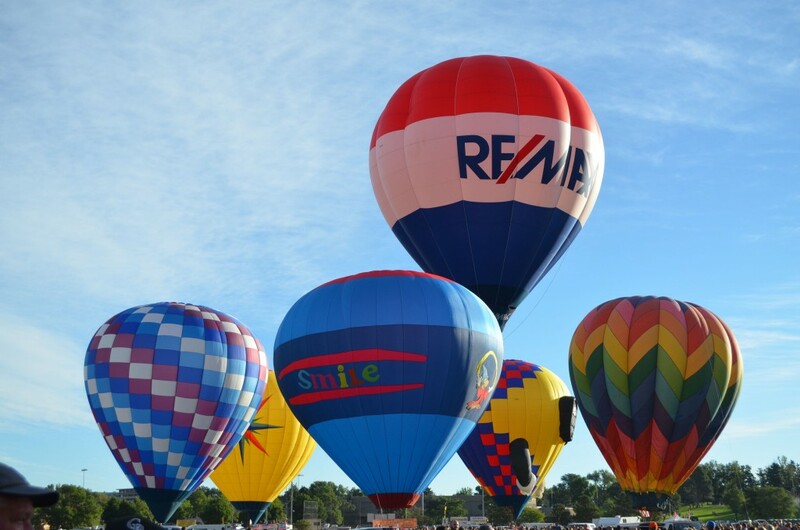 Over Labor Day weekend, Colorado Springs held its annual “Labor Day Liftoff” Balloon Festival. 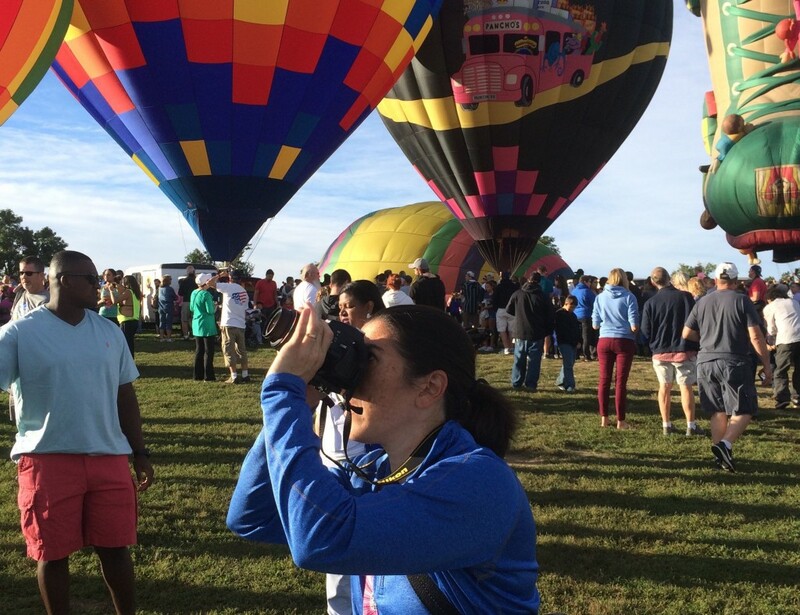 Those who know me well know how much I love hot air balloons. The colors, the science behind them, and the peace and quiet one enjoys while riding them are all beautiful. No, I’ve never been on a hot air balloon ride, but I’ll do it one day. There’s time. 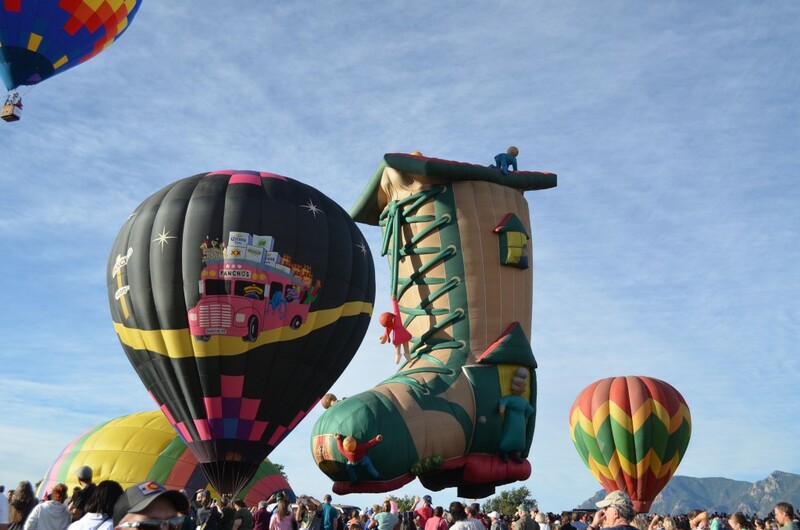 The Albuquerque Balloon Fiesta has been on my personal bucket list (#7) since I was a young girl. I had a subscription to National Geographic Kids magazine when I was a pre-teen and one issue featured the Fiesta and came with a beautiful poster that I promptly taped to my wall. I remember the “Tony the Tiger” balloon on the front cover of the magazine, in fact. 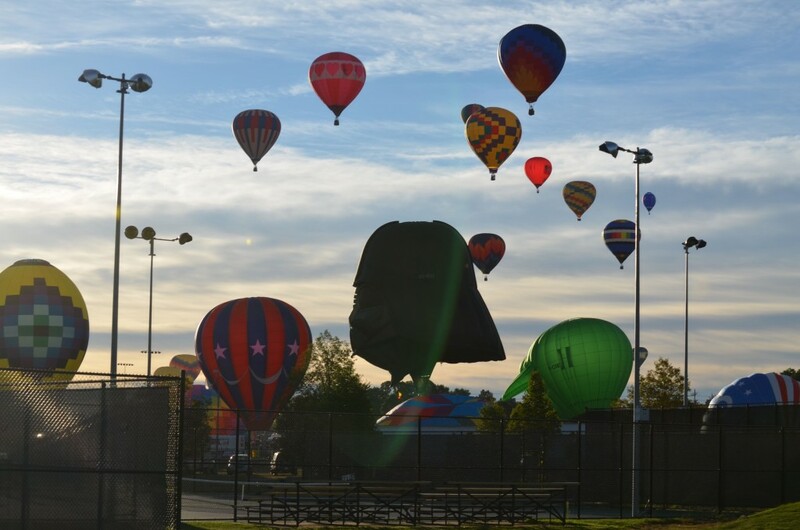 Here in Colorado Springs, the Labor Day Liftoff was a triumphant return for an event that had been discontinued after 2014 (formerly known as the Colorado Balloon Classic). Dave, Timmy, and I made a trip out to downtown’s Memorial Park to see the action. This meant getting up VERY early. Each day of the event there were two liftoffs, one at 7am and the other around 7:30am. Our family was a little slow going to get out to the park, but made it on site just as the end of the first group of balloons was lifting off. From a distance we saw Darth Vader and Yoda lifting off. This was on our walk from the car to the park. During the day there were numerous activities, vendors, and live music. There is also an evening “balloon glow” where the flames from the heating elements light up the sky. However, we arrived at about 7:30am and we didn’t stay for too long after the second wave lifted off. 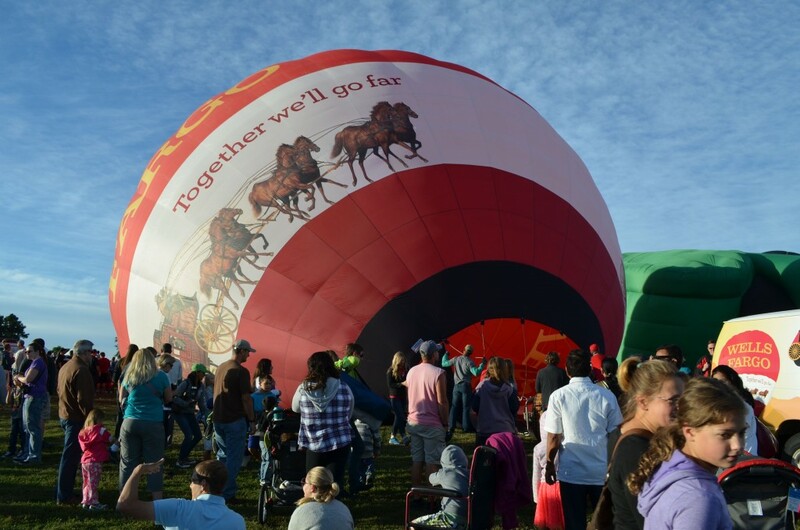 We watched the Wells Fargo balloon inflate and upright itself, then listened to the emcee announce each balloon as it lifted off. The first wave. The weather was perfect! 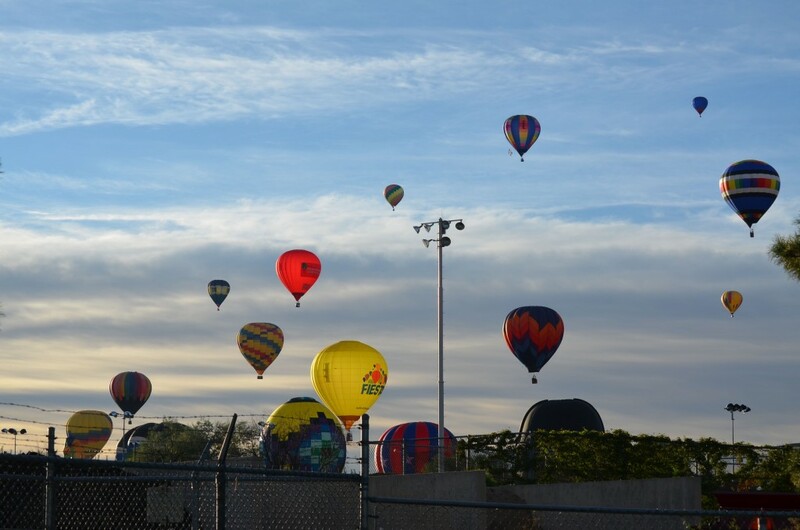 These balloons need winds of less than 10 mph to fly, and they were given those conditions each day of the event. We had a front-row view of this balloon inflating. I got a kick out of seeing this Re-Max balloon, since its the companys logo. Hot air balloons bright colors have always brought me happiness. This was a fun balloon to watch inflate and lift off. 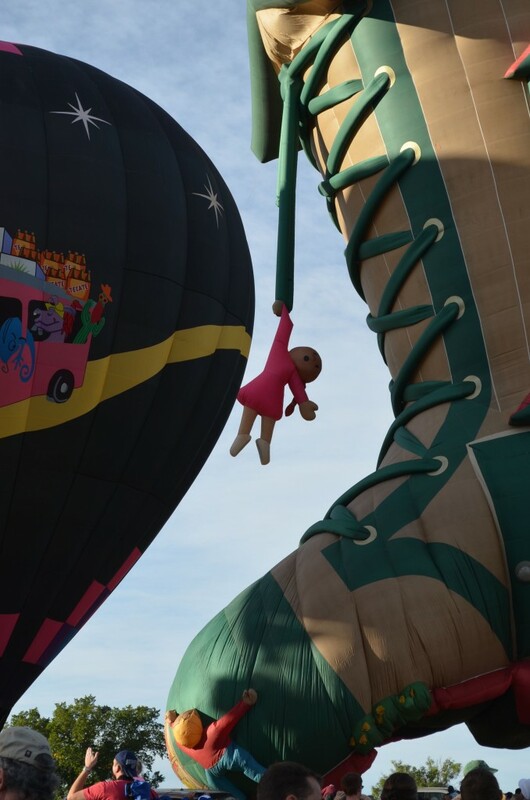 A closeup of the girl dangling off the shoelace. Timmy enjoyed the liftoffs, but after they left he grew bored so we didn’t stay for too much longer. We stayed about 90 minutes total. We hit a fun nearby doughnut shop on the way home (along with hundreds of others who were at the event), and many of the balloons were floating over us while we waited in line for our dozen. The event is held in at Memorial Park in downtown Colorado Springs every Labor Day weekend. Keep up with this year’s events at their website. I think I might like to register to be a crew volunteer one day. 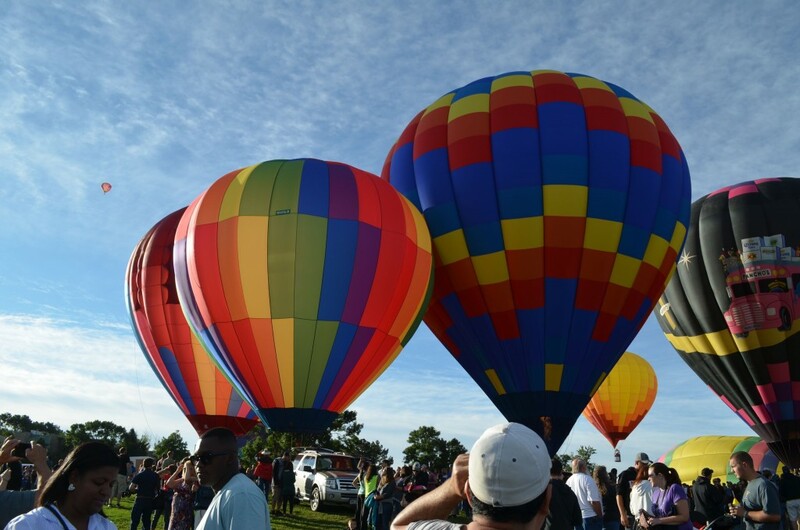 If you don’t live near Colorado Springs or Albuquerque, you can find hot air balloon festivals throughout the U.S.